An article showing how I installed my new top from Prestige in England. They have an 800 number, cost less and... they will install a zipper window for Midgets. Before starting I needed to replace my top webbing on the bows as they were cracked and dry. I have gotten yellow type material for my flat belt metal turning lathe for the 67 Midget, but this time I needed black so I bought BIC-410. It's not cheep (I paid about $60 for enough for 2 cars), but it's cut on the bias and laminated with a smooth side and a rough side (smooth side up to the top). They will ask what chemicals it is exposed to, or UV rays etc. They are only making sure they give you the right stuff. They stock all sorts of conveyor belting like anti-static for the computer chip and board assembly lines etc. Now back to the top installation! Step 1 - Install the tenex fasteners first around the back and installing the retainer with the screws and snaps across the back under the rear window. Make sure you have enough material at the header bow first. Step 2 - Cover the top and back window and interior as you are going to spray the 3M spray glue (for fabric to metal or like product) across the header bow and on the underside of the material where it lays on the bow. Now you can press the material against the header bow, but you have about 15 mins to change your mind and lift off the material to reset it. This gives you an extra set of hands. Step 3 - Lift the bow back away from the windshield and stick the material under neath the bow. Step 4 - I used some 3M trim adhesive in a tube where I will reinstall the retainer strip on the header bow. Step 5 - Use an awl to locate the rivet holes and start in the center working out to each side with your pop rivet gun. I used an air operated one, but a hand one will do just get them real tight and you will need longer than 1/8 go for the next longer size. Also make sure you are using the steel shank with steel rivet for strength. Be very careful as I ruined one top when a razor blade skipped (always use fresh blades as old ones skip when a bit dull but they always cut something you didn't want cut). You might want to use blunt scissors. 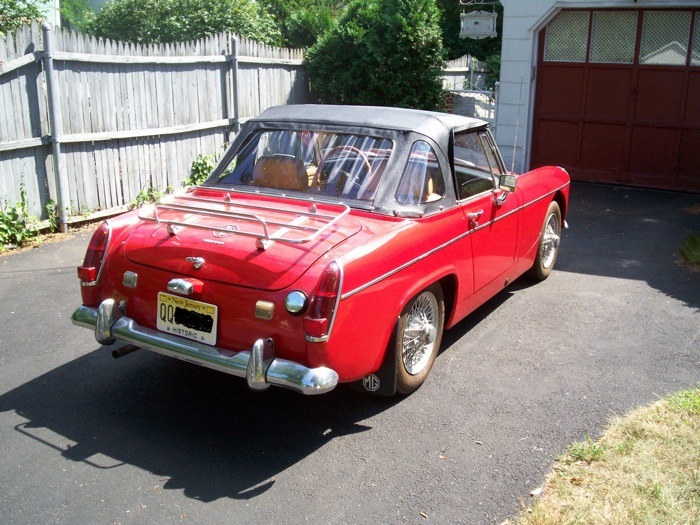 I did find that on both of my Midget tops from Prestige, that at the valance over each door comes up short on the passenger side for use of the snap at the windshield. Otherwise their tops are great, and the zipper window is wonderful to have. 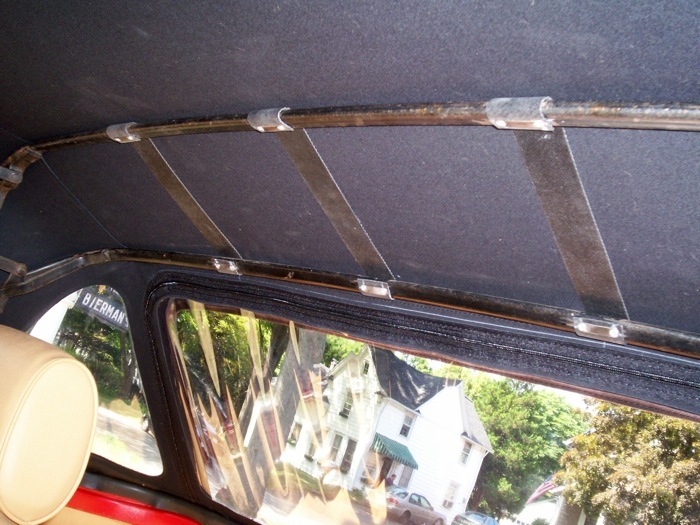 Comments on "Soft Top (Hood) Installation for MG Midget"
I am restoring a 1979 Midget and wondered what material to use for the straps on the convertible top frame. I found this post and contacted the merchant mentioned. Belting Industries are still active in Kenilworth, NJ at (800) 843-2358. I spoke to Dave F. who researched the order placed above and told me BIC-410 is available. The minimum order is a "sleeve" (think sleeve of a shirt) which is 6" wide by 49.87" long. They will cut the sleeve into 3 strips that are 2" wide by 49.87" long. I didn't proceed with an order as I don't need that much material and the price is higher in 2016. Dave F. was very helpful and professional.